Ronald Frederick Lane was very proud of being born on April Fool’s Day 1946, not that he had much say in the matter, and was actively encouraged by his father to be a musician. He bought his first guitar and before long had formed his first band called The Outcasts with a budding drummer called Kenney Jones whom he’d met in a local pub. Ronnie’s mother, Elsie, suffered with ill health from around the time Ron was born which was later discovered to be Multiple Sclerosis which exacerbated the situation. Ronnie said, years later, that his mother was often cold and distant but he spoke extremely highly of this father Stan once referring to him as a Saint. The Outcasts evolved into the Small Faces – so named because all members were around five and a half feet tall – and Jones and Lane were joined by Steve Marriott on vocals and guitar and Jimmy Winston on organ. After their debut hit, Whatcha Gonna Do About It? Winston was replaced by Ian McLagan. They amassed a dozen UK hit singles, 10 of them being written by Lane and Marriott. In 1969, Marriott left to form Humble Pie which halted the band immediately but it proved to be a good omen because Lane, McLagan and Jones teamed up with Ron Wood and Rod Stewart, who had both been with the Jeff Beck Group and re-Christened themselves The Faces and went on to have five UK hits, the biggest being the 1973 number two hit Cindy Incidentally. One of Lane’s most well-known songs was Ooh La La, the title track of The Faces’ fourth album and was eventually a solo hit for Rod Stewart in 1998. In 1973, Lane left The Faces and bought a farm in Wales but in 1977 his health began to suffer. He consulted a doctor who diagnosed him with the same degenerating disease that his mother suffered from, MS and so in the 1977 he moved back to London. He tried a number of different ‘alternative’ treatments to help slow the effects of the disease some of which worked well. Lane, who was known as Plonk and was a real East-end city boy with a twinkle in his eye, went on to form Slim Chance, a band Ronnie often joked that he found the musicians for in a copy Exchange and Mart. He chose the name because when the Small Faces disbanded, due to poor management they were deeply in debt and Ronnie thought that all the musicians would be regarded as a bunch of nobodies and believed they had little chance of succeeding and decided there was a ‘slim chance’ of making it again. The original line up comprised Kevin Westlake and Benny Gallagher on guitars, Billy Livesey on keyboards, Chris Stewart on bass, Jimmy Jewell on saxophone, Bruce Rowland on drums and Graham Lyle on backing vocals. Before any success Gallagher and Lyle left for a solo career and were replaced by Robin Lucas and Drew McCulloch. Steve Simpson, Charlie Hart and Steve Bingham were also members at various times. The label credit on both of their hits credit Ronnie Lane accompanied by the Band Slim Chance almost implying they were just backing him rather than ‘his’ band. Their first success was with the song How Come which charted in January 1974 and reached number 11, but due to bad timing the follow up had problems because as Westlake remembered, “It would have been a hit had it not been for the BBC technicians strike at the time. We turned up to do Top of the Pops only to be told there would be any show for a few weeks by which time the record was dead,” and so it never got the television exposure it needed and the song stalled at number 36. Ronnie’s music was very London and The Poacher was the epitome of his rural dreaming. “The idea for The Poacher came to me when I was living in a fortune teller’s caravan by the side of the River Thames at Pete Townshend’s back garden,” Lane said, Townsend added, “He was homeless at the time and they lived like gypsies and they used to cook in the open air.” The Poacher is a very unassuming song which tells the story of a lonely man wandering down to the river with his mind upon his (fishing) tackle. He seemingly tells it from his own point of view saying ‘I went towards the river’. He sets the scene of a bright and clear day with peace all around and maybe a bit fed up with the world as his words say ‘And I’ve no use for power And I’ve no use for a broken heart I’ll let this world go by’. He clearly is rejecting the world. Former Small Faces keyboard player Ian McLagan one said of Lane, “He was often prone to gazing off into the middle distance,” and this becomes evident in The Poacher. The track appeared on the 1974 album Anymore for Anymore which barely troubled the UK album chart, but Ronnie loved making the music. His wife Kate always said, “Ronnie wanted to bring music back to the people, he thought doing it for money and fame was wrong.” The album was recorded in Ronnie’s mobile studio on his Farm in Hyssington, Wales where he moved in 1973. He loved to play on the hillside as well as record there, if you listen carefully you can hear various band members’ children shouting in the background. 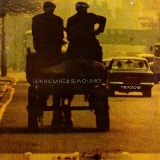 Ronnie and Slim Chance recorded two further albums; Ronnie Lane’s Slim Chance (1975) and One for the Road (1976) then in 1977 began working with The Who’s Pete Townshend on a project they called Rough Mix, but things didn’t work out too well, Eric Clapton said, “He wasn’t actually hitting the strings, he was sort of just hovering above them,” and Townshend said, “He couldn’t balance, he couldn’t stand up, and I just thought he was drunk,” sadly it was his multiple sclerosis. In 1984, Lane emigrated to Texas where the weather was more beneficial to his health, 10 years later he and his wife moved again, this time to Trinidad, Colorado initially with Rod Stewart, Ronnie Wood and Jimmy Page covering his medical bills because Lane couldn’t earn and the royalties for songs he had written were not forthcoming. In June 1997 he caught pneumonia and died on 4th June that year aged just 51.